Have you ever had difficulty understanding another person due to language differences? Have you ever traveled abroad or encountered someone from a different culture here at home and wondered why people from other cultures act in ways that are unexpected? Have you ever reflected on the ways that your own behavior is often heavily influenced by the culture you live in? Questions like these are the focus of the study of inter-culturality. Inter-culturality attempts to become aware of differences between cultures, striving to bridge those differences so that successful and meaningful relationships across cultures can occur. This is useful for relationships around the world and around the corner. The Western Iowa Synod Companion Synods Network will be delving into inter-culturality in the coming year. The network is seeking resources, presenters and opportunities for growth that will help all of us strengthen and deepen our cross-cultural relationships. Be watching for more in the year to come! The Companion Synod Network will offer two opportunities in 2017 for travel to visit the Western Iowa Synod's companion churches. The first trip, scheduled for the summer of 2017, will head for the Southern Diocese of the Evangelical Lutheran Church in Tanzania. In the fall, another group will be able to visit the Evangelical Lutheran Church in Chile (IELCH). "These trips are great opportunities for personal growth, for deepening companion congregation and companion synod relationships and for each individual to have what can be a life-changing experience," says Companion Synod Network chair, Arlyn Norris. "I have taken five of these trips and have been blessed richly each time." If you have never been to one of our companion synods, this will be a great time to go. Interested persons are encouraged to pray and to consider whether God is calling them to make such a trip. Applications and other information about this trips can be found here on the WIS website. Is God calling you to such an adventure? Emanuel Lutheran Church in Council Bluffs recently made a gift of $7,704 to the Igumbilo Lutheran Girls School. The Emanuel 125th Anniversary Committee had chosen the Girls School project as a way to help celebrate and express gratitude to God for 125 years of faithfulness and grace. Jan Rosdail-Aegeter, a member of the Western Iowa Synod Companion Synod Network, received the check for the gift at Emmanuel's November 20 worship service. During the year of their anniversary celebration, the congregation held several fundraising efforts to raise money to make this gift possible, including a garage and bake sale and a Salad and Dessert Bruncheon held in cooperation with the WELCA Tabitha cluster. They also offered envelopes to members of the congregation for individual gifts. ​​​​​​​The Girls School at Igumbilo currently serves over 400 students. It makes education available to young women in Tanzania, who otherwise might not have an opportunity for secondary education. Emanuel’s gift will help provide scholarships for the neediest of students at the school. It will also make educational resources such as laboratory equipment, mosquito netting, laptops and textbooks available for the students. 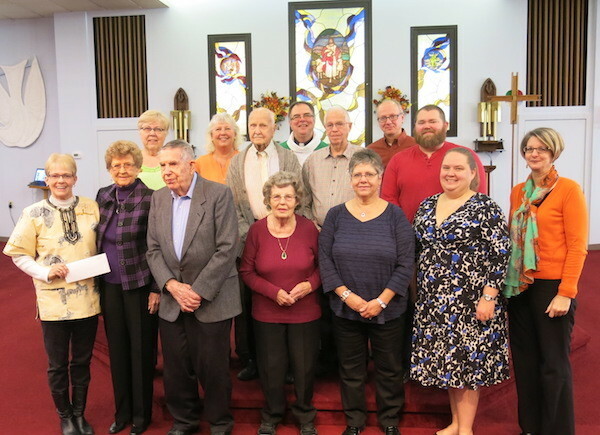 Jan Rosdail-Aegeter, member of the Companion Synods Network, received a check for $7,704 from Pastor Lowell Hennings and members of the Anniversary Committee at Emanuel Lutheran Church in Council Bluffs. The check was the result of several fundraising efforts on behalf of the Igumbilo Girls School. Often the church faces challenges when it tries to secure the resources needed to take advantage of new opportunities for ministry. That makes it imperative for the church to explore fresh ways of funding new initiatives. The Companion Synod Network believes it has identified both a new ministry that would be of benefit to members of our companion synod, the Southern Diocese of the Evangelical Lutheran Church in Tanzania, and a potential way to fund that ministry. The ministry is to help start 12 additional SACCOS groups that will provide much needed micro-loans for small-holder farmers and other small business entrepreneurs. The network believes that this project is particularly suited to a crowdfunding campaign. The Companion Synods Network recently added two new persons to its membership—Katie Hare, who serves as the director of Youth and Family Ministries at Bethany Lutheran Church in Spencer and Ann Williamson, a member at First Lutheran Church, West Okoboji have begun meeting with the network. Katie comes from eastern Iowa and has been working at Bethany for about a year. She says "I decided to become a part of the network because I would love to work with our companion synods on Youth Ministry. I hope I’m able to contribute ideas on how to get our youth more involved with our Companion Synods." play. Her husband, Neal, is the director of Agriculture at Iowa Lakes Community College in Emmetsburg. She has been active in her congregation, directing dramas, serving on the Missions team, and singing in the choir. Anyone who might be interested in joining the Companion Synods Network is encouraged to contact Cindy Wells, the WIS Director for Global Missions. The network seeks to expand its membership in order to support the WIS companion synod relationships. The CSN is happy to announce that two more congregations from the Western Iowa Synod have entered into new Companion Congregation relationships. Bethany Lutheran Church of Emmets-burg has partnered with La Paz Lutheran Church in Osorno, Chile while St. Mark's Lutheran Church in Sioux City has agreed to walk together with Buen Samaritano Lutheran Church in Santiago, Chile. Evangelical Lutheran Church in Chile and the Southern Diocese of the Evangelical Lutheran Church in Tanzania. A companion congregation relationship creates a deeper, more personal relationship by pairing up a congregation in Western Iowa with a congregation in the Southern Diocese or in Chile. Some congregations may choose to develop companion congregation relationships in both Tanzania and Chile. For more information about becoming a companion congregation, contact Cindy Wells, the WIS Director for Global Mission.